If you’re an avid Facebook user (alright, who isn’t anyway? ), you’re probably tired of refreshing Facebook.com just to see the latest updates from your Facebook friends and contacts. For busy people, that could get pretty annoying at times. The good news is, there are several desktop applications available which allow you to receive Facebook updates in real-time without you going to Facebook.com. We’ve selected four of these Facebook applications. We’ve got one apps for both Windows and Mac users, as well one multi-platform applications and an Adobe AIR app. So, here are the four best Facebook Desktop Apps that let you do your Facebook activities without visiting your Facebook profile. This Windows application has been out for quite some time now and it has been pretty reliable when it comes to providing you with real-time updates, as well as for viewing wall posts, messages and even friend requests. Facebook Desktop requires small memory footprint from your PC and requires .NET Framework 2.0. Mac OS X’s Facebook Dashboard Widget – Facebook Desktop’s counterpart for the Mac users, this Facebook application is actually a widget designed to let you receive Facebook notifications on your Mac’s dashboard. 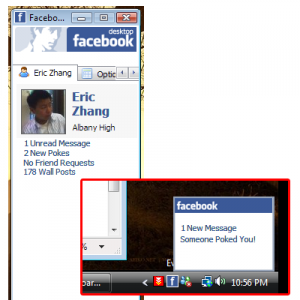 It displays messages, pokes, friend requests, group invites, and event invites. The good thing about Dashboard Widget is the fact that you can fully customize its look. 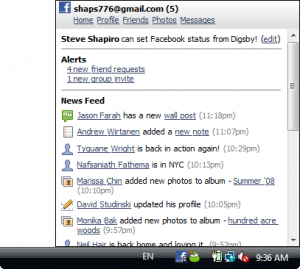 Digsby is a multi-function, multi-platform application that lets you do most of your online activities including instant messaging, email notifications and of course social networking. For its social networking features, Digsby lets you stay up to date with everything that’s happening in your Facebook social circle. It also lets you receive alerts of important Facebook events including friend requests, new messages, group invites and more. Digsby’s social network inbox serves as a NewsFeed aggregator of your Facebook friends’ new uploaded photos, status updates, and upcoming birthdays. And of course it also lets you set your status on Facebook without visiting Facebook.com. Running on Adobe AIR, Seesmic Desktop has now fully integrated Facebook using the recently made public Facebook API. Seesmic Desktop allows you to post updates to your Facebook profile as well as receive all your Facebook updates on your desktop. This practically means that you don’t have to visit Facebook.com anymore, and refresh the page often just to know recent updates from all your Facebook contacts. In addition, Seesmic Desktop also allows you to “like” feed items from your Facebook friends. I’ve tested Seismic Desktop and I would have to admit that the application is indeed robust and looks neat as well. Running Facebook updates side by side with my Twitter updates is indeed a time-saver. Hopefully, Seesmic integrates Friendfeed updates as well. He what about Fishbowl. It is a heavy app but it has some cool and nice features. I just love it. Does anyone know of a similar app?